On completion of this year's Summer Handicap League Praa Sands and Treloy with identical records share the title as winners of the 2018 competition. Both clubs were presneted with the trophy and tankards at the CGU Annual Dinner on 18th November 2018. Treloy v Clowance not played. CGU Decision: the outstanding match was not played through no fault of Praa Sands, who topped the table at that point. By awarding a 4-3 win in the unplayed match to Treloy the title of winners can be shared between Praa Sands and Treloy, with prizes awarded to both clubs. Budock Vean GC captured the 2016 Summer Handicap League Trophy despite losing their last match of the campaign. Pivotal to their overall win was an away victory at Praa Sands and this win was one of only two in the entire series of matches, the other being claimed by Cape Cornwall. The league yet again proved a very close affair with 5 teams just two points behind Budock Vean. Those 5 teams could only be separated on individual games won and it was Radnor who finished runners up on that basis. The trophy was presented to Budock Vean at the CGU Annual Dinner. Budock's SHL Captain Dennis McQuillan is seen below receiving his memento from CGU President Glyn Rowett. 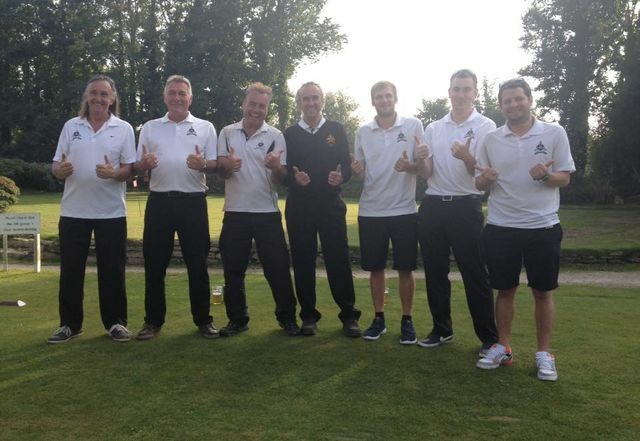 The team from Clowance GC - pictured above courtesy of their secretary Susie Dale - claimed an impressive away win at St Kew GC on Saturday and in so doing won this year's Cornwall Golf Union Summer Handicap League for the first time in their history. Clowance, lying in second place in the league, travelled to their St Kew opponents knowing that only a win would take them above local rivals Budock Vean who had already completed their fixtures. The competition which was introduced first some 7 years ago is open to clubs with a playing membership of less than 250 and sees teams of 7 players from each of the clubs playing singles matchplay across the summer period with three home and three away games. Forced to concede one of the 7 matches before the start, it was St Kew who drew first blood as Andy Jones beat Richard Bassett 5&4 but this was to be one of only two wins for them, the other coming from Paul Hunt who beat Steve James by just the 1 hole. With one point already on the board Clowance took a win in a tight match as Dave Searle beat Scott Chandler by just the one hole. By this time Darren Goldsworthy had gained another point for Clowance in beating Gary Baker 4&3. Clowance now had their foot in the door and when Captain Adam Coleman delivered a 3&2 win over Dave Rickard they knew the title was theirs. In the remaining match Clowance gained a further point as Phil Lawrence beat Toby Trudgian in yet another close encounter with just the one hole in it. The final match score was 5 - 2 in favour of Clowance. The win was enough to see them pass Budock Vean who are this year's runners up. Budock Vean, themselves two time winners of the competition, had the same number of points as Clowance but the latter's individual game wins within matches was superior. Bowood Park finished third. Coleman was delighted with the team's win. He said "This feels so good. I am proud to be the Captain of Clowance and for such a small club to win this makes me even prouder. We have a good bunch of guys who love this competition and to win it for the first time is just great. We can't wait to collect the trophy at the County Dinner". Picture (L to R) Phil Lawrence,Richard Bassett, Dave Searle, Adam Coleman (Captain), Simon James, Darren Goldsworthy and Darren Browning. Treloy Make it Four in a Row! Treloy GC yesterday captured the Summer Handicap League Final for the fourth year in a row when they defeated Praa Sands 4-3 in a close final staged at Perranporth GC. The teams had reached the final of the competition, which exists for clubs with smaller membership levels. Treloy had topped their group outright after the series of round robin matches with St Kew and Radnor whilst Praa had to win a playoff against Budock Vean in their three man group which also included Clowance, after the two clubs could not be separated. Yesterday however belonged to serial winners Treloy in the 7 man singles matchplay final played over 18 holes and off handicap. Treloy's winning team is pictured above with Captain James Morpurgo receiving the trophy from CGU President David Inch. Treloy were giving shots top their opponents in all the matches. There were several convincing wins in the final; Treloys Carl Langslow and Morpurgo both had 5&4 wins over Praa’s Steve Strick and Simon Phillips respectively whilst Praa’s Paul Murrish and Roy Hillyar recorded 3&1 and 4&3 wins over Mike Martin and Ian Hugh. The other three games were much tighter though. In the top match Praa’s Ryan Semmens defeated Matt Milburn at the 20 th hole after the pair had finished a tight match all square on 18. This was cancelled out by Treloy’s Rick Hamilton a recent winner of the CGU Petherick Cup at St Austell. He beat Praa stalwart Mike Jacka by 2&1. The defining win for Treloy came from Dave Rid as he defeated Dave Rollason 2 up. The prizes were presented by CGU President David Inch who congratulated both clubs on reaching the final and their performance in it as well as thanking Perranporth GC for their customary excellent hospitality.